He stared at the mirror looking at the image of an odd man staring back. He felt the breaking sweat on his nape and forehead after a quick hot shower. Last night’s pochero still appealed to him. Its steaming thick soup cleared his nasal clog. A piece of this tenderized beef quickened his belly. He remembered his father’s marquee line, “the Lord does not require you to win, He does require you to try.” The month of May is slowly inching out from his life, all of 67 years. He has not used his hair piece for quite some time. It’s time to have this oddity pasted to where it belongs. He could hear the whispers of his distaff staff of a familiar name he’s sure refers to him. Twenty years in the judiciary looked uneventful. A few reversals by the Supreme Court are his only consolation. No, he does not find contentment at par with a litigator. He is a jurist par excellence. The face on the mirror suddenly becomes acceptable. His salt-and-pepper toupee perfectly hews his round cranium. Fifty years ago his first inamorata told him he had the bonhomie. Four years in law school took a toll on his face. He believes he is telegenic though with a baritone voice his students found attractive despite his thick Cagayan de Oro accent. But today is like no other day. A few hours from now, the media would be at his bidding. Obscurity would soon be past him. He is going to preside over an application for a temporary restraining order by Meralco, the power distribution company behemoth. The papers on days on end logged the impending take over by the GSIS, a government retirement provider, of the giant electric firm. He knows that this gobbled-up threat is orchestrated by the President. A quid pro quo is not far behind. It was Erap who appointed him in May, 1999. Mayor Vicente Emano wasted no time signing his credentials. His cell phone’s familiar ring tone sounds sweet to his ears. Finally, in these parts, he is at the center of the universe. During a get together with his co-alumni in Procter and Gamble many years back, he announced that soon if not later he would reach the pinnacle of his career as justice of the Supreme Court. As Regional Trial Court Judge of the southern cities of Tangub, Gingoog and Cagayan de Oro for several years, his stint was as bland as his favourite balbacua in Barangay Gusa. His decisions in the lower court merely regurgitated settled jurisprudence. He longed to handle the case of the century and append his name to his ponencia. How about a Sabio doctrine? In no time his destiny awaited him. The round face on the mirror would soon have a name etched on granite. Destiny awaited him no doubt. How can one explain the turn of events when the presiding justice of the 9th Division (out of 23) was replaced twice? This certainly was it. The interesting times the Chinese crow about. Again his handphone disturbed him. It reported three missed calls already. The number was unregistered. But that gave him some lift. His phonebook seemed bare, skinny. Now was the time to add some real biggies to his directory. The real serious players. 60% of his phonebook entries were just old friends in Cagayan. Sometimes it took him weeks to return a call. Why bother when returning a call promptly was just a waste of time? But sitting in some corner at Robinson Mall along Padre Faura was worth his while to touch base with pestering relations from far away Misamis Oriental. To him, an inconsequential person who called was a pest. He was a big fish in the Gusa pond. Swimming in the big national ocean would be in no time at all. Breaking into the national consciousness was the penultimate thrill to a jurist like him. While he knew that any disposition at his level was subject to appeal, he was well aware of the value of the Court of Appeal’s preliminary ruling. He found himself in the midst of public relations maelstrom. Initial victory to one party mattered most. Up there was just plain p.r. callisthenics. The government did not want embarrassment. It could not afford to lose at this stage. 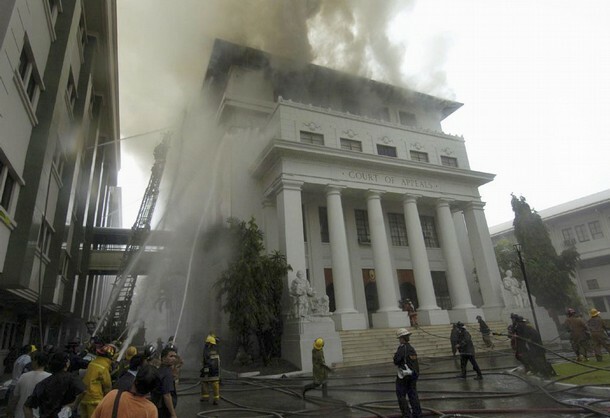 Malacanang knows the Court of Appeals is an uncontrollable mob. Due to its sheer number of justices, it has hold-outs from previous administrations of Ramos and of course, Erap. It still smarted from the humiliation Mayor Jejomar Binay wrought before the May 2007 elections when the diminutive Makati Mayor snagged a temporary restraining order issued by an Erap appointee, His Honor Enrico Lanzanas, and eventually a preliminary injunction against an Ombudsman’s fast tracked suspension order. He knew that Malacanang had placed its bet on its stooge Winston Garcia. The words of Winston were nothing but the words of the President. With Winston legendary physical heft, he was just GMA’s bulldozer, nothing else. When he was in P & G in Cebu, he met Winston when the latter was a fledging practicing lawyer. The man loved to eat. Soon he felt deep down, Winston was going to call him. With the revolutionary cellphone, no one these days can run and hide. The so called judicial modesty has now become Jurassic. His younger colleagues in the Court sport multiple cellphones. The self-deprecating excuse is that one is for official use, i.e., for the missus, and the rest are for the rest of the world. But he had not seen such a number of jurists in his old building in Orosa constantly talking on their remote phones. Even on deliberations and oral arguments, justices suddenly multi-task by half listening to oral debates and check on their SMS messages or send one. Yet he knew that these honourable men and women didn’t always receive text messages that spelt life or death. Most were plain domestic reminders and jokes. Some of them in one division owing to camaraderie and familiarity even shared the text messages in the middle of a hearing unmindful of hiding their glee on the banter. Finally, the unknown number sent a text message. “Justice Gud AM dis is Francis de Borja Can I kol u.” His memories suddenly stream before him. “This is the guy who thought had bought me”. In 1993, a land transaction involving the sale and development of a 400 hectares land near the Lumbia Airport in Cagayan de Oro with complicated partition among the Ex-Mayor Oloy Roa heirs was brought to him for unravelling. Being a Regional Trial Court Judge is a ticket to expediting complex paper works. That’s how they do it in Cagayan. Why hire a lawyer and bleed for acceptance fee when the local agencies would just give him the run around? He knew the BIR revenue district officer, the register of deeds, and the local assessor. With a local judge as the consigliore, it is akin to the popular arrangement of hecho derecho, i.e., “everything’s in there.” Most importantly his intervention suggests any recalcitrant would go nowhere since a judge is already untangling their differences. Going to court is an exercise in futility and may only antagonize the judge. His influence in the Hall of Justice could not simply be ignored. All he had to do was to draft all the legal papers with his stenographer and had them notarized. Compared to a transaction in Manila, one in Cagayan doesn’t have to be incubated that long because that was the only transaction anyway. In no time at all, the buyer was handing a manager’s check to the squabbling heirs. Waiting for the parties to get settled, they engaged in small talk. De Borja bragged that he had good connect in Malacanang. Was the judge interested in getting promoted? That was during the Ramos administration and the Firm was also well-entrenched. It was the first time that de Borja dropped the name of Pancho Villaraza. He said de Borja didn’t have to bother. Deep down he felt slighted by the impertinence and presumptuousness of the man. Who did he think he was? Hadn’t he cultivated his own network all the way to Malacanang? He had his own share of hotshots who were willing to bankroll his appointment to the appellate court. But he didn’t want to dismiss the man outright. A sizeable contract was on their hands for disposal. De Borja was just one low-life who believed that rubbing elbows with the bigshots was a diploma for having arrived. The judge thought that he wouldn’t be surprised if this guy would again surface later on and boast for being an emissary of a litigant. After the closing of the Cagayan de Oro land deal, he was called by de Borja to meet him at VIP Hotel along Velez Avenue to have coffee with him. There, de Borja handed him a short Manila envelop with crispy three hundred one thousand bills. He thought that his share was too minuscule compared to the 3% this dreg earned in the transaction. The man had short-changed him. To this day, he nurtures some resentment against de Borja for having arbitrarily fixed his “legal fee”. Pueblo de Oro Golf and Country Club located at the erstwhile 400-hectare Roa estate today commands a P1.2M membership with playing rights. Twice he ignored his vibrating handphone. When he checked the caller, it was the number of de Borja. On the third time, he decided to pick up the call. His contrived unavailability is one message to de Borja, that like the latter, he too has arrived. He hit the red button while the last word of de Borja was still audible. He felt a chill down his spine. For no reason at all a trickle of sweat fell from his unruly false bangs. De Borja wouldn’t call for no reason at all. This time, de Borja is in for a big surprise. He is no longer the promdi judge. In this brewing controversy between the President of the Republic and the giant electric power company, he is virtually the sun where all these personalities, major and factotums, revolve around. There is one hitch however. He is not the only one who craves for the limelight. His destiny is in danger of being derailed. The chair of the 9th Division and the ponente of the TRO, Justices Bienvenido Reyes and Vicente Roxas, want him expelled from their division. De Borja’s phantom seems to dissolve into the light when J. Reyes suddenly appear in the horizon to reclaim his chairmanship. He knows J. Roxas, a dyed-in-the-wool Sigma Rhoan, and appointed in the appellate court only on February 6, 2004. At that time, the Firm was the unofficial Commission on Appointments of Malacanang. Nonong Cruz, a fellow Sigma Rhoan, was the Secretary of National Defense. He found solace however in the novelty of the issue. Section 1, Rule VI of the 2002 Internal Rules of the Court of Appeals, as amended, which says: “Justice Assigned for Study and Report. – Every case, whether appealed or original, assigned to a Justice for study and report shall be retained by him even if he is transferred to another Division in the same station,” is still virginal in the law books. The lawyer in him told him to hang on to the chairmanship. His protestations might enrich this third world jurisprudence. In the event of a high court appointment, his colleagues would find it hard not to sustain him. But something disconcerted him. He remembered de Borja dropped the name of Villaraza, the senior partner of the Firm in the thick of Heirs of Roa- Investment and Capital Corporation of the Philippines (ICCP) negotiation. Three things bothered him: J. Roxas is a Sigma Rhoan; was only appointed in 2004, prior to the Presidential elections when the Firm called the legal shots in San Miguel; and on May 30, 2008 he personally brought to J. Sabio’s office the draft of the TRO. One doesn’t have to be Sherlock Holmes to figure out the tentacles of the Firm on the case. De Borja never called during the entire month of June. The appellate court was embroiled in turf war. J. Roxas suddenly became scarce thinking these differences would soon be ignored. Nobody in his right mind is going to blow the whistle on them. But J. Sabio knows J. Roxas keeps the bigger bag. The signature of J. Roxas was the give away. Meralco has to get the services of the Firm. Descending from the steps of the old Court of Appeals building, he looked at the direction of Roxas Boulevard. The July sun was always behind some dark and foreboding clouds. He drew a deep sigh. He looked back at the Parthenon-like Doric architecture behind him. Was it the image of Icarus gazing back at him? His shoulders stooped as if conceding that he was just passing thru this great institution where once jurists of note sat and wrote immortal legal disquisitions. 15. On that same day, by the time I had finished my class at 8 p.m., Mr. De Borja was already waiting for me at the Lobby Lounge of the 3rd Floor of the Ateneo Law School. His first words to me were: Alam mo Justice kung sino ang kasama ko ngayon sa kotse? Si Manolo Lopez. Then he said: Noong tanungin kita at sinabi kong “Mabuhay ka Justice,” si Manolo Lopez and katabi ko noon. Papunta siyang America, kaya ako na lang ang pumunta dito para makiusap sa ‘yo. Alam mo, itong kaso na ito is a matter of life and death for the Lopezes. And alam mo naman what the Marcoses did to them, which is being done now by the Arroyos. At that point he mentioned the impasse between Justice Bienvenido Reyes and myself. He said: Alam naming may problema kayo ni Justice Reyes tungkol sa chairmanship. 5.1.1 Justice Sabio confided that he was the Acting Chairman of the Division hearing the case but that he was very piqued with the regular Chairman of the Division, Justice Bienvenido Reyes, who was exercising efforts to reclaim his seat. I was surprised how he came to know about it, as this was an internal matter of the Court of Appeals which only happened fairly recently and many associate justices of the CA were not even aware of this. Just the same, I explained my stand and why I could not relinquish the chairmanship to Justice Reyes. 15.1.2.5. He said that he had consulted other colleagues in the Court of Appeals and that they had told him that he was in the right and should stick to his guns. 15.1.2.6. He said he had two children who are both lawyers and he had discussed this matter with them and they had likewise advised him not to give way. 15.1.2.7. He vowed that he would hold on as Acting Chairman of the Division for the case even if he had to elevate the matter to the Supreme Court. He then replied: Alam mo, Justice, ang opinion dito ni Nonong Cruz ay i-challenge ang stand mo. Kaya lang, mayroon namang nagsabi na it might become messy. Then he bragged to me: Ako din ang responsible sa pag-recommend at pag-hire ng Villaraza Law Firm. 16. Justice Sabio then told me about the blandishments coming from the government side. He said that he was being offered a promotion to the Supreme Court and money to favor the GSIS position. Then he explained that he was there to offer me a win-win situation. He said: Justice, mayroon kaming P10 million. Ready. 16. At that point, I was shocked that he had a very low regard for me. He was treating me like there was a price on my person. I could not describe my feelings. I was stunned. But at the same time, hindi ko rin magawang bastusin siya because I had known him since 1993 and this was the first time that he had ever treated me like this, or shown that he believed I could be bought. So I just told him: Francis, I cannot in conscience agree to that. 17. I was nonplussed by this last statement since Justice Sabio had just expressed suspicion about the motives of Justice Reyes and other Division members in their wanting Justice Reyes to resume the chairmanship of the Division. He, in effect, had just given me his motive for wanting to remain as Acting Chair of the Division. 18. I concluded that this was probably the reason why he was hanging on so desperately to the Acting Chairmanship of the Division. If he would give up the said Acting Chairmanship, he would lose his chance for a Supreme Court seat and the promise of monetary consideration. His answer was: Sabi ko na nga sa kanila, mahirap ka talaga papayag. Kasi may anak iyang Opus Dei. Numerary pa.
At this point, I just wanted to leave, so I told him I could not stay long. I told him my wife and lawyer daughter were waiting. Even then, he was already insistent. His parting words before I left were: Just think about it, Justice. 21. I was so taken aback by the answer of Justice Sabio and the huge amount he had mentioned that I was at a loss for words to say. After regaining my composure, we made our goodbyes as his wife was already waiting for him in their car. 17. When I went down to the car park, I told my wife and daughter about what Mr. Francis De Borja tried to do to me. Both of them got angry and insulted on my behalf. They likewise expressed the sentiment that, although we did not know him well, we thought he respected me as a person. I also told them that Mr. Francis De Borja bragged to Manolo Lopez of his perceived closeness to me at pinapaniwala niya siguro si Manolo Lopez na kaya niya ako. 18. At this point, I thought I had made myself clear to Mr. De Borja that I was rejecting any offer. But Mr. De Borja would not quit. A day or two later, I found out that Mr. De Borja called up our mutual friend in Cagayan de Oro, Mrs. Evelyn Roa Clavano. He actually urged Mrs. Clavano to ask me to give way to Justice Bienvenido Reyes because they cannot be sure of me. 19. I found out about Mr. De Borja’s call because a few days after that meeting, I had called Mrs. Clavano about some personal matters. It was during that call that I was again shocked to learn that Mr. De Borja had called her. She told me she was also shocked that Francis De Borja had the gall to ask her to convince me to accept the bribe. As we speak, Mrs . Clavano is finalizing her affidavit on the phone conversation she had with Mr. De Borja and this statement will be faxed to me within the day. 20. Again, I was still of the opinion that since I had given a firm NO to his offer, I thought the matter had already been settled. Mr. De Borja, however, kept pestering me with phone calls and text messages. On this point again, I challenge him to produce his phone records to disprove what I am saying. 21. By this time, I had begun to feel oppressed by his pestering. I called him up to tell him once and for all to stop pestering me. Let me say again: I never initiated the calls to him except this single time after he kept pestering me with his text messages. When he answered the call he said: Mabuti naman Justice tumawag ka, kasi malapit na ang deadline ng submission ng memorandum. Pinag-isipan mo bang mabuti ang offer namin? Kasi sayang din kung di mo tatanggapin, Kasi kahit aabot itong kaso sa Supreme Court, matatalo ka din. Sayang lang ‘yung P10 million. Baka sisihin ka pa ng mga anak mo. Again, I was shocked at the things he was saying, and could not believe he would repeat an offer which I had already rejected. I repeated my “NO.” And then, because his insistence seemed to me like he could not understand why I kept saying “NO,” I tried to explain: If I accept that, my conscience will bother me forever. How can I face my wife and two daughters? One a lawyer and the other a Numerary member of Opus Dei? And besides, how can I reconcile my being a member of PHILJA’s Ethics and Judicial Conduct Department; being a lecturer of the MCLE; and being a Pre-Bar Reviewer of the Ateneo Law School on Legal and Judicial Ethics? At that point, he told me: Wala naman kaming pinapagawa sa iyo na illegal, eh. makakalimutan na ito ng mga tao. And he said: Meron naman diyang mga Atenista na tumatanggap. I told him: I don’t know about them, but I am different. Then he said: Well, if you will not accept, we will be forced to look for other ways. Then I told him: But they will have to contend with me. As a parting statement, he said: Justice, no matter what, saludo talaga ako sa iyo.